MICHIGAN TRUTH SQUAD ANALYSIS: "What if Congress got medals?" The American Future Fund is a 501(c)4 focusing on issue advocacy "designed to effectively communicate conservative and free market ideals." A lenghty report from ProPublica earlier this month (http://www.propublica.org/article/how-nonprofits-spend-millions-on-elections-and-call-it-public-welfare) detailed how these 501(c)4s are engaged in political activity: "On the very day in 2008 that the American Future Fund mailed its application to the IRS, checking the box for ‘no’ on whether it planned to participate in politics, it uploaded an ad to YouTube praising a Republican senator. The group reported more than $8 million in political spending in 2010." Under IRS regulations, 501(c)4s are not required to release the identities of their donors. Questionable statement: "She (Debbie Stabenow) voted for the $2 trillion health care law and failed stimulus that spent almost $1 million to study the division of labor ants. (Screen shot: Since Stabenow took office, federal spending has soared - $16 Trillion Debt.)" Sen. Stabenow, D-Mich., voted for the Patient Protection and Affordable Care Act, H.R. 3590. However, a recent report by the Congressional Budget Office reveals that the net cost of the Affordable Care Act will actually be $1.1 trillion over the next 10 years. Various stimulus bills have gone before Congress for a vote, which Sen. Stabenow has supported. The 2009 economic stimulus bill, also known as the "American Recovery and Reinvestment Act" or ARRA, according to many economists and the CBO, has not been a failure. An Aug. 23, 2012, CBO report found that ARRA raised real GDP, lowered the unemployment rates and increased the number of full-time-equivalent jobs. The CBO released a report finding the 2009 stimulus package added 5.31 million jobs from 2009-2011. According to a report issued by Republican senators in 2009, about $500,000 in stimulus funds "went to Arizona State University to study the genetic makeup of ants to determine distinctive roles in ant colonies; and $450,000 went to the University of Arizona to study the division of labor in ant colonies." Overall U.S. debt is nearing $16 trillion. Since Stabenow became a member of Congress in 1996, there have been numerous debt level votes and many of which have received bipartisan support. The rising debt has gone up through a number of presidents and Congress dating back years. The Associated Press reference is to an article comparing candidate positions from the 2006 Senate campaign, "Bouchard, Stabenow Weigh In On Issues" in which Stabenow is quoted as saying she favored "reducing" the estate tax. In July, Stabenow voted for a tax plan by Sen. Harry Reid, D-Nev., that called for allowing for the expiration of current rules on estate taxes, thereby bringing higher rates into play. It is not clear who the "3.5 million Michigan residents" are. Questionable statement: "Not only are they dealing with high taxes, Detroit has 18 percent unemployment." According to the state, the non-adjusted unemployment rate in the city of Detroit in July was 21.1 percent. The non-adjusted figure for June 2012 was 18.3 percent. The income tax rate in Detroit is 2.5 percent for residents, and 1.25 percent for non-residents. Those are the highest rates among Michigan cities that levy an income tax. The millage rate on a principal residence in the city in 2011 of 67.2798 mills was among the highest of any local government in Michigan in 2011. Of course, those tax rates are not set by federal officials. Overall impression: Most of the ads numeric claims pan out. However, The American Future Fund should know that when depicting someone from Michigan in a commercial, that it should reflect their home state. Other than some imported palm trees to the Wintergarten at the Detroit Renaissance Center, palm trees do not exist in Michigan. Foul or no foul: Foul and technical foul. 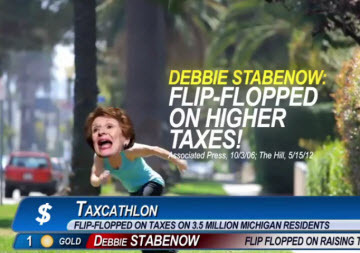 The ad is generally OK on Stabenow's voting record. However, it earns a foul for getting the cost figure wrong on the Affordable Care Act. And a technical foul because it does not prove as fact that the federal stimulus "failed."